Ultraviolet irradiators - artificial get ultraviolet radiation used in preventive and curative purposes. As part of ultraviolet irradiators there is a source of ultraviolet radiation, which are used as mercury-quartz, erythematous or bactericidal uviol lamp. Fig. 1. Irradiator on a tripod. Mercury-quartz lamp (GOK - direct mercury-quartz) fluorescent is a source of ultraviolet radiation with wavelengths from 180 to 400 nm. Consists of a quartz tube, filled with argon and contains a small amount of mercury. Ultraviolet radiation arises due to the electric category in pairs of mercury inside of quartz tube, transparent to UV rays. At both ends of the tube electrodes are soldered. In the chain lamp included: capacitor connected with spring button (for ease of ignition), throttle and step-up transformer (when the voltage in the network 127). The operating mode of burning lamps with radiation full spectrum of ultraviolet rays is set in 5-10 minutes after inclusion in the network. Irradiator mercury-quartz on a tripod (Fig. 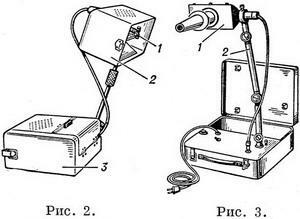 1) is intended for local and General exposure; consists of a portable lamp-2 (Fig. 1, 1), installed in a horizontal position in the metal reflector (Fig. 1,2), which moves along a Nickel-plated rods (Fig. 1, 3). On the cover of the casing (Fig. 1, 4) is electropitanie the device: switch, power sockets for connection of the supply chain devices lamps, start button. Fig. 2. The feed table. Fig. 3. Irradiator short-wave ultraviolet irradiation OKUF-3. Fig. 4. Mercury-quartz irradiator for the nasopharynx. Fig. 5. Mercury-quartz lighthouse irradiator (large). Irradiator mercury-quartz portable table (Fig. 2) is intended for local ultraviolet irradiation; consists of lamps PortPC-4 (Fig. 2, 1) reflector (Fig. 2, 2), mounted in a suitcase or a metal case (Fig. 2, 3). At the base of the irradiator posted electropitanie the device control panel. Irradiator about mercury-quartz nasopharyngeal used for exposure of mucous membranes cavity of the mouth, nose and ear simultaneously in 4 patients. This feed is also used for local irradiation of the skin. Consists of a cylindrical body (Fig. 4,1)in the center of which is vertically lamp PortPC-4 with four tubes (Fig. 4, 4). On tubes put replaceable tips (Fig. 4, 3). Unused tubes are closed caps (Fig. 4, 6). To control the accuracy of space radiation nasopharynx each tube is equipped with a mirror (Fig. 4, 2). At the base of the irradiator (Fig. 4, 5) is the supply part. The lamp is included into a wall socket lighting network. Irradiator shortwave ultraviolet radiation (OKUP; the old name KOF-lamp, or LKOH) mercury-quartz is used for conducting local and abdominal irradiation. Consists of lamps PRK-4 and casing reflector (Fig. 3,1) on a tripod (Fig. 3, 2). For the lamp is used electric current, ultra-high frequency, generator, which is mounted in a suitcase irradiator. Irradiator mercury-quartz lighthouse (Fig. 5) is intended for prevention and treatment total group exposure of adults and children. In the head part (Fig. 5, 2) irradiator lighthouse large - lamp PortPC-7 (Fig. 5, 1) and in the irradiator lighthouse small lamp PortPC-2 fortified vertically by sliding vertical racks that allows to change the height of the lamps above the floor. 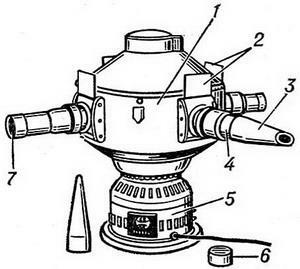 Electropitanie the device is under the cover at the base of the irradiator (Fig. 5, 3). Bulb is covered with protective cap (Fig. 5, 4), which removed during irradiation. The exciter is switched into the network through the switch through a three-core wires, one end of which is used for grounding.